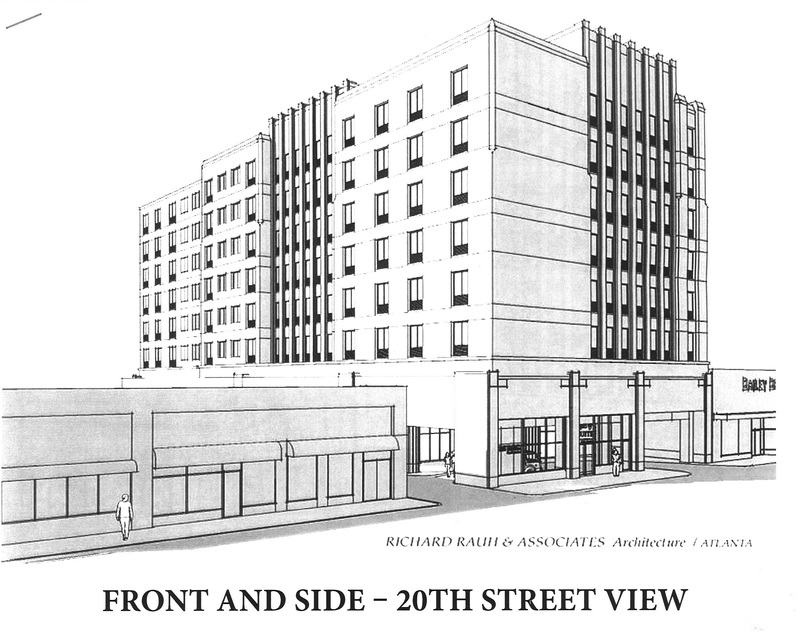 Today at Design Review Committee the developer of a new hotel on the west side of 20th Street South a half block south of the fountain in the historic Five Points South neighborhood presented a revised exterior scheme. We last saw this proposal over a year ago; since then the exterior has traded its “bland suburban” character for something more attuned to the Art Deco surroundings of the area (above). However, the proposal was denied, and the applicant asked to return to a special subcommittee that would work with him further. Part of the issue is that the new structure sits on an historic base–a former music club and, previously, a Piggly Wiggly grocery store–and that base is unsuccessfully integrated with the new facade above. While the new facade is certainly an improvement over the earlier design, the devil is in the details (and no true details have been presented yet). If all those vertical bits and chamfers will be formed out of synthetic stucco, we may be end up with poorly-executed historicism. We’ll have to see how this one progresses. Also denied was a revised Pepsi advertisement (above), designed to wrap around the electronic message board at Two North Twentieth, the former Bank for Savings building at Morris Avenue and 20th Street North. The Committee found this new design still too inartistic and commercial to warrant such a huge, full-color, singular statement on the City skyline. A frustrated building representative may consider appealing this ruling. This City was built on commerce, and the old electric sign is grandfathered. But the Committee is clearly drawing a very firm line here. This entry was posted in Uncategorized and tagged Design Review Committee, Five Points South, Harbert Realty, Two North Twentieth. Bookmark the permalink. Jeremy, to what extent is the limestone facade of the old building to be kept? Surely they can work around that? In any case– it’s HUGE! I hope it takes up that whole confiscatory parking operation behind the Pig. The limestone façade is being kept entirely; the main challenge is that the storefront glass is disappearing, and the openings are now totally open to a new porte-cochere space beyond…I also think a building is torn down for more parking along 10th Avenue as part of this project, which then adds on to the parking you describe (it all is then gated). Which is unfortunate…but I think that site plan was previously approved. A shame we have to create more surface parking with a large city deck just down the street that’s underutilized. CORRECTION: the new building actually extends all the way back to 19th street, covering the existing parking lot behind, which becomes a garage. The adjacent existing building on 10th does appear to be coming down for more surface parking. Harbert Realty should be ashamed of this proposal. It’s a billboard, nothing more. Good to see DR reject it. Glad to see progress on this. However, it sounds like a surface lot will occupy much of the area around 19th and 10th, which is rather unfortunate. I’m assuming a plan (that encourages pedestrian-friendly development along street edges and concentrates surface parking to the interior) for that block doesn’t exist. You are correct. It’s unfortunate, but of course within current (antiquated) zoning guidelines. Another example of why form-based code is so essential in neighborhoods like this, to encourage pedestrian-friendly development. Thanks. Indeed, Jeremy. Thanks for the follow up. Keep in mind it’s a “Homewood Suites” hotel, which is an upper-tier extended stay national chain; so don’t expect anything unusual inside. It will be similar to the Residence Inn or other competitors–relaxed/corporate. If only the Pickwick across the street could become the super boutique it needs to be…Thanks. The billboard slogan is a dead giveaway that no thought went into localizing anything. They’re about 400 miles south of anywhere “pop” would be common usage.